Alice Gerrard has been documenting music through performance, writing/editing, and film throughout her forty-year career as a traditional musician. Her most notable accomplishments as a documentarian include The Old-Time Herald, a periodical for which she served as founding editor-in-chief from 1987 until 2003, and her film Sprout Wings and Fly. Gerrard is a talent of legendary status. She has known, learned from, and performed with many of the old-time and bluegrass greats and has in turn earned worldwide respect for her own important contributions to the music. She is particularly known for her groundbreaking collaboration with Appalachian singer Hazel Dickens during the 1960s and ’70s. The duo produced four classic LPs (recently reissued by Rounder on CD) and influenced scores of young women singers—even The Judds acknowledge Dickens and Gerrard as an important early inspiration. Gerrard’s two solo albums, Pieces of My Heart and Calling Me Home, were released on the Copper Creek label in 1995 and 2004, respectively, to critical acclaim in Billboard, Bluegrass Unlimited, New Country, and other publications. 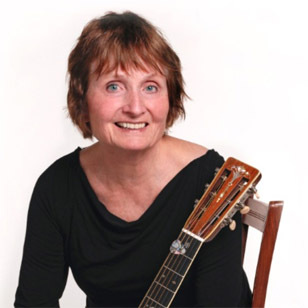 These superb recordings showcase Gerrard’s many talents: her compelling, eclectic songwriting; her powerful, hard-edged vocals; and her instrumental mastery on rhythm guitar, banjo, and old-time fiddle. As a musician, Gerrard has appeared on more than twenty recordings, including projects with many traditional musicians, including Tommy Jarrell, Enoch Rutherford, Otis Burris, Luther Davis, and Matokie Slaughter; as an expert with in-depth knowledge of mountain music, she has produced or written liner notes for a dozen more. She also co-produced and appeared in two documentary films. A tireless advocate of traditional music, Gerrard has won numerous honors, including an International Bluegrass Music Association (IBMA) Distinguished Achievement Award, a Virginia Arts Commission Award, the North Carolina Folklore Society’s Tommy Jarrell Award, and an Indy Award. The daughter of trained classical musicians, Alice Gerrard didn’t grow up with bluegrass or folk music. Her earliest musical memories are of singing along with family members and friends around the living room piano. Gerrard’s albums with West Virginia–born folksinger Hazel Dickens, however, rank among the most influential recordings in folk music history. Gerrard’s first exposure to folk music came while she was attending Antioch College in Ohio. Inspired by the folk songs played by dorm mates, Gerrard abandoned the piano and became absorbed with the more rural sounds that she heard on such albums as The Anthology of American Folk Music. When she moved to Washington, D.C., to complete her college experience, Gerrard encountered a thriving bluegrass scene, where she met numerous bluegrass and old-timey musicians, including Mike Seeger of the New Lost City Ramblers, who introduced her to Dickens. She and Dickens soon became frequent performers in the folk clubs and coffeehouses of the Capitol region. Their repertoire continued to expand as they studied sheet music at the Library of Congress and taped old-timey musicians at folk festivals. Gerrard and Dickens’ debut album, Who’s That Knocking, released in 1965, was recorded for $75 at the First Unitarian Church in Washington and featured accompaniment by David Grisman (mandolin), Lamar Grier (banjo), and Chubby Wise and Billy Baker (fiddles). Their second album, Won’t You Come and Sing?, featuring the same musicians, was recorded the same year, but wasn’t released until 1973. Gerrard and Dickens’ first two albums were later combined and released as Pioneering Women of Bluegrass in 1996. Gerrard also recorded two albums with Mike Seeger, Mike and Alice Seeger in Concert in 1970 and Mike Seeger and Alice Gerrard in 1980. Gerrard performs and tours regularly with Tom Sauber and Brad Leftwich as Tom, Brad & Alice. She also performs with the Herald Angels and the Harmony Sisters, and very occasionally with Hazel Dickens.